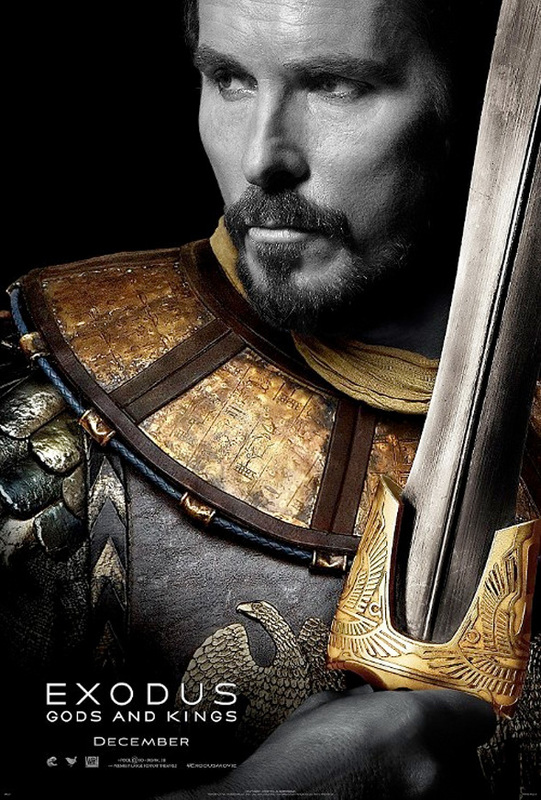 Later tonight, the first trailer for Ridley Scott's Biblical epic Exodus: Gods & Kings will arrive. 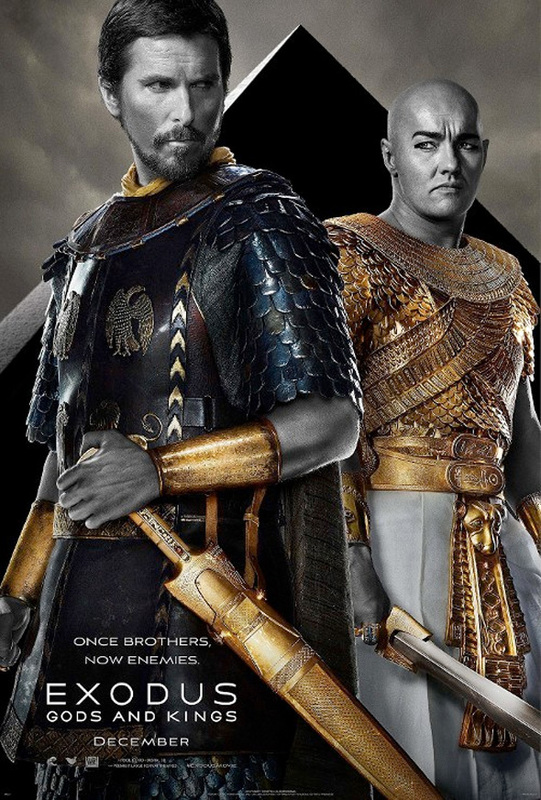 We've just gotten a first look at the film starring Christian Bale and Joel Edgerton as Moses and Ramses II respectively, and now the two stars are featured on some golden posters for the film arriving just before Christmas this winter. They're not all that great, to be honest, mostly because the head of Christian Bale looks poorly Photoshopped onto his body in both posters featuring the actor. 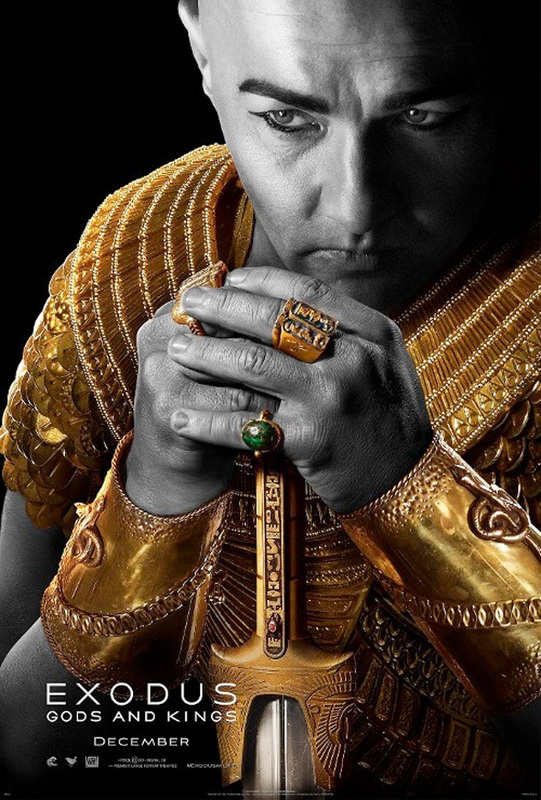 Plus, we can't help but notice that Edgerton looks pretty odd as the Pharaoh on these posters, though we can't see his orange skin. Look! This just looks strange.....so Moses was a warrior? I Mean do they just give pictures to children and instruct them to make a poster these days? I suspect most children could come up with more interesting designs than these. truly embarrassing on every possible level..
Maybe the first one with Christian Bale but the rest look weired. Hope it is better than Noah, shouldn't be a streach, but turning all this historic figures into ninja fighters makes me nervous. I love these. They look like Versace ads. LMAO! Yeah, I guess they kinda do. I for one like the b&w and gold design. The rest, photography etc, looks very uninspired though. So no Egyptian/Middle eastern actors couldve played Rasmes? Like none whatsoever? Yeah, the first poster with Christian Bale looks straight but the rest...eh. I'm kinda interested in seein the trailer tho. Moses looks like a centurion. I am Moses, Deliverer of The Ten Commandments; not Maximus Decimus Paganus, the gladiator. My wife is not named Brian neither. So better get your life in order otherwise I shall part the Red sea and we can all go fishing for more food. No more pyramid schemes too. And so it is written. So it will be done. Exodus Chapter 4 (1611 Bible) 6 ¶ And the Lord said furthermore vnto him, Put now thine hand into thy bosome. And he put his hand into his bosome: and when hee tooke it out, behold, his hand was leprous as snowe. 7And he said, Put thine hand into thy bosome againe. And hee put his hand into his bosome againe, and plucked it out of his bosome, and behold, it was turned againe as his other flesh. MOSES WAS A BLACK MAN!!! THESE MOVIES ARE BLASPHEMOUS!! !